Where we aim to meet and greet America's wild horses and burros on their terms. 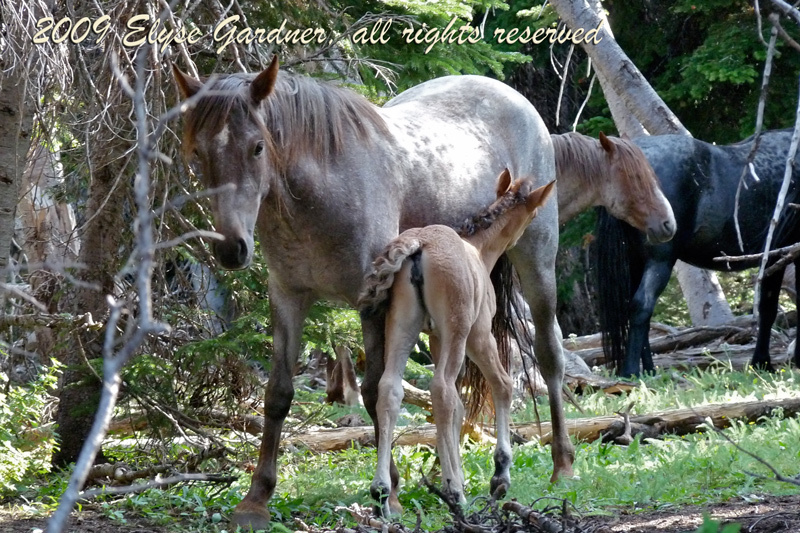 I stood rapt watching this young wild mare and her first foal (Halcyon and Adelina) on this beautiful summer day in the Pryor Mountains, and the dread started working its cold grip up my chest. Wild horses in the mountains in family bands took turns drinking and playing in their family groups at the large water hole. The horses in their natural lives on the mountain in their families were spellbinding, and my new camera and I gobbled up the feast of images in an effort to capture the fullness and quiet beauty of the majesty of the horse families. Everything about the horses living on the mountains was right. I walked toward a wooded thicket, following the sounds of an occasional snort and swish of a tail as the grazing horses kept their customary summer fly vigil. I peered through some bushes and literally stopped in my tracks so I didn’t spook the lovely grulla mare and her resting baby. The mare saw me and told her filly it would be a good idea to get up, which is what she is doing in the photograph to the right which looks like she posed for the camera. But these horses were somewhat accustomed to human visitors, so although wary, she didn’t leave. The filly, Adelina, stood up and started eating lunch as her very young mother, still just a filly herself at only just over two years old, continued to rest her eyes on me. The trust she showed honored me tremendously. You can’t help but take it personally when a horse, wild or domestic, trusts you. Makes you feel special and understood. But when a wild one trusts you, it’s one of the best feelings in the world. As Halcyon nursed her baby, Adelina, I recognized her parents, Red Raven and Blue Sioux, made famous by Ginger Kathrens in her first documentary about Cloud, the palomino stallion, who I encountered about 10 minutes later. 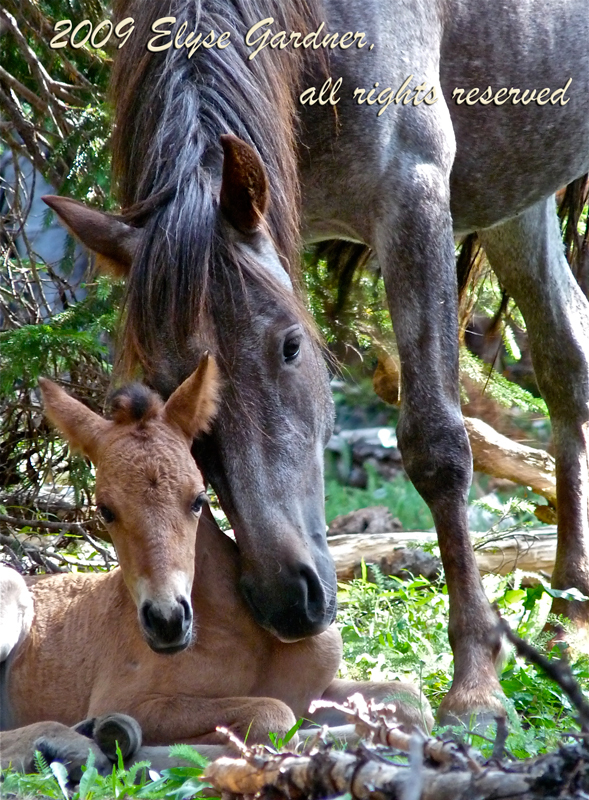 As Halcyon nursed her baby, Adelina, I recognized her parents dozing quietly behind her, Red Raven and Blue Sioux, made famous by Ginger Kathrens in her first documentary about Cloud, the palomino stallion, who I encountered about 10 minutes later. Red Raven is Cloud’s red roan brother. He and Blue Sioux have a unique bond and quite the love story, which Ginger captures in her documentary. At the time of my photograph here, they had been together over nine years. Three generations of wild horses stood together quietly in that thicket. My peace was steadily eroding, consumed by the dread creeping over me. I had never seen a wild horse helicopter roundup before, but these animals would be chased over 10 miles in 90-plus-degree heat in just a few days. I was scheduled to leave the day before it started. This infant, whose hooves were not even hard yet, couldn’t run 10-plus miles! How on earth could these people seriously proceed with this plan? How could I leave? I hope you will come back next week when I will pick up with more Wild Horse Times and give you an update on these horses and more. Thank you for stopping by! This entry was tagged Adelina, BLM, Blue Sioux, Bureau of Land Management, Elyse Gardner humane observer, Halycon, mustangs, Red Raven, wild horses. Bookmark the permalink. Dearest Elyse, Beside writing my congressman and senators, what can I as an individual do to make a difference? It makes me sick to know there are so many heartless people out there mistreating these beautiful and amazing animals. We have yet so much to learn from the wild horses and it’s a shame to see them pushed out from the wild, all because of power struggles from ranchers and big corporations. Can’t tell you how much I appreciate all the information you are putting out here. Hope more people wake up and see what is going on. Elyse, I am so glad to see you begin another blog. Your blogs were so helpful to me when I began trying to understand what was happening to our wild horses. I appreciated your willingness to correct or amend your original comments when you had new information. Jumping for joy. Thank you for your very kind words, Christie, and your hard scrutiny and intelligence I have observed you apply to all things pertaining to our wild horses. I am earnestly touched at having played a part in your introduction to the horses and burros. It is my mission statement coming to pass, which makes me go,”YES!” Thank you! I just read H. Alan Day’s book The Horse Lover. Mr. Day is Chief Justice Sandra Day O’Connor’s brother. He had the first wild horse sanctuary. Although a cattle rancher he managed some 1500 horses for about 4 years. He details how BLM told him to select out the 700 biggest heaviest horses. That these horses which up to date had been identified as unadoptable were suddenly adoptable. Soundness wasn’t an issue. Missing an eye wasn’t an issue. Pretty wasn’t an issue. These horses were adoptable. Mr. Day didn’t really follow through but I think we all know where they went. Then later the BLM rep came back and told Mr. Day that the 25 oldest thinnest horses had to be destroyed. Mr. Day writes how it tore him up to shoot those horses. He was the one to do it. He would not give that dirty job to anyone else. I really recommend this book for any wild horse advocate. And for racing fans I recommend Jo Anne Nomile’s book Saving Baby. Jo Anne was the one who founded CANTER. Thank you for this background information, Margaret, and for hanging in there with the horses and burros. Nice to hear from you! Reading your paragraphs made my heart drop, what a powerless feeling to know these wild beast (beast in the highest regard) horses have been swapped up from their land without a thought.As I attempt to wrestle with the reasonability for the governments action, beyond financial and selfish agricultural means, I find none. All to often the powers that be act in cruel and unthinkable ways. Thank you for your eloquent words. I shall fallow your story closely. Animal family pods are misunderstood or simply not cared about. There should be discretion taken when mothers and offspring are involved. What are they doing with these horses? Slaughtered for food, used for labor? Looking forward to more info. Horses are herd animals, and although they crave the presence of other horses in general, they do often form deep attachments to specific individuals. In my experience observing both wild and domestic horses, truly close friendships are not easily replaced, and from these traumatic roundups, animals routinely experience tremendous loss and unmistakeable, heart-wrenching dejection evident to anyone who cares to notice. The Bureau of Land Management is stockpiling wild horses in government holding facilities as well as large ranches in the midwest called “longterm holding” facilities, where ranchers are paid per horse to house 200 to sometimes 1,600 or more animals. I hope you will stay tuned to learn all about the failing Wild Horse and Burro Program and what small steps from you can make big differences for the horses. Since the adoption rate of wild horses are not supposed to be sold directly for slaughter, which is not legal in the U.S., but they are doing with these horses is removing them from the range; that is to say, they don’t have a purpose for removing them other than competition for the land that is their home, so they are being stockpiled. In a not-too-distant post I will show you a video of a stallion’s reaction at the loss of a daughter who BLM (Bureau of Land Management) removed to place her with another band, which was unnecessary tampering because wild stallions seldom, if ever, breed with their daughters. Some horses will call out for herd mates and pace back and forth, exhibiting obvious anxiety for hours when a herd mate or barn buddy is taken away. Your comment is reminding me of many topics I look forward to covering in this exciting new blog. Please stay tuned, and keep your great feedback coming. I sure hope the government will stop rounding up the wild horses. It doesnt make any sense why they would do it. DO you know why they are rounding them up? Thank you for your comment. It usually comes down to competition either for the land (forage to feed cattle and sheep) or water. The primary competing interest for the wild horses’ homes on our public land are the ranchers who graze privately owned livestock — cows and sheep — on grazing allotments they have on our public land, paying only $1.35 for a cow and her calf per month, a fee that has not changed since 1935. Most — not all, however — ranchers feel entitled to graze their cows on public land and view the horses as useless pests eating valuable forage that would feed their cows, which feed people. There are also mining and mineral leases which demand water use, which at times means taking the water source that was relied upon by the wild horses. The BLM has routinely removed the horses if there is no water to sustain them rather then use our tax dollars to intelligently manage wild horses on the range as the 1971 Wild Free Roaming Horse and Burro Act mandates them to do. Please stay tuned to learn more about these amazing animals! I sure hope the government will quit rounding up the beautiful animals for what what seems to be no reason. Please keep us readers in touch. Thank you, Shutterdayz! I hope you like the next peek into these Wild Horse Times. It may be too long for some. I would like feedback on that issue, please. Thanks, mates! Elyse, as I read your paragraphs, I was reminded of a children’s book I just read, “The Girl Who Circumnavigated Fairyland in a Ship of Her Own Making,” by Catherynne M. Valente. It is set in a surreal alternate world, and on one of the journeys, the young heroine September and her companions get across a vast plain by riding a herd of wild bicycles (like wild horses)! But that story was exciting and fun, while yours appears to be heading in a sad direction. There are some very sad parts to their story, yes. There are also wonderful stories I will be sharing of horses being reunited with friends and family, of horses being adopted and loving their new homes, of horses finding humans who provide wonderful lives for them. I have one of those 🙂 And the more of us who learn about them, the more happy stories they have! CLICK THE GREEN BROADCAST SIGNAL TO SUBSCRIBE and have WildHorseTimes delivered to you each time we share a new post. You can subscribe to POSTS, or COMMENTS, or both.